This topic contains 10 replies, has 7 voices, and was last updated by V. Arnold 4 years, 8 months ago. NATO is like Cujo these days, the most heavily armed rabid dog ever. Could Bardarbunga go off big enough to give us some non-war emergency, big enough to get us all on-board behind our shadowy puppet masters? I’m grasping at straws, and willing to pray to the aliens, if it will help. There seems to be some sort of a common understanding shared by the people running this show. Something uniting them in their calls for wars in so many places at once. Something that causes them to embrace torture and mass murder as good things. Something they feel vindicates their constant lying and deception. Something that not only forgives their incredible levels of theft from honest citizens, but enshrines it. Is it greed? The people at the top have far more money than their families could ever hope to spend, so I can’t imagine why it would be greed. On the other hand, maybe it’s just a matter of the Rothschilds always getting their way simply because nobody’s price is ever too high. Is it power? That would presume that the kicks one gets from jerking around millions of people are beyond what could be derived from wine, women, song, honest achievement or sport fishing. Is it control? Sure, we humans are unruly, but we’d do just fine (actually much better) without the controllers. Is it blackmail? Have all our “leaders” been threatened if they don’t go along with the big plan? Or perhaps it’s the ultimate blackmail – – the Sampson Option – – in which case, Israel does indeed rule the world. But that still leaves the question of what motivates the blackmailer? Is it psychopathic ego? All the visible warmongers do seem to love the camera, the prestige, and inflated feelings of self-importance. Is it supernatural “evil?” Some people blame Satan, some blame Satanism. The Devil makes the elites do what they do. Is it religion? Maybe there’s a shared vision of the future from holy books. A promise of future utopia, if only we rid the planet of the ones God hates. Is it petroleum reserves? Is it land? Is it other resources? Why have the anointed ones decided to act criminally and as enemies of mankind? Is it population reduction? Are all the people in charge Malthusians? Is it malice? Are they all sadists? Do they just love being the ones to make people suffer? Is it fear? They do have good reason to be terrified by us, especially considering all they’ve done to make us terrified of them. I’m sure all those motivations explain a lot of the crimes against mankind we see from the people pulling the strings, but I’m still unable to discern why so many of them seem to be on the same page, as if they all support a master plan – – an overarching conspiracy – – with dozens of subordinate, complementary conspiracies that dovetail. Am I a conspiracy theorist? Of course. How could an informed person be otherwise? You’d have to be completely daft not to see it, or possibly an idiot. Take your pick. The richest, most powerful movers-and-shakers of the world and their minions are the terrorists. You’re either with us, or you’re with the terrorists. Every developed country, having taken way, way more than their fair share of the world’s resources, also want to take what’s left. If they have to lie, cheat, create chaos and mayhem in order to get energy cheaply, so be it. If you are a country with a lot of resources and you want to get a fair buck for them, watch your back. They are coming for you. Diogenes – once you have power, you don’t want to lose it, you want to maintain your position. As our leaders are unethical/diabolical power-hungry types, they know there are people just like themselves who wouldn’t hesitate to gain control if they could. It takes one to know one. This is all about staying on top. A big game. 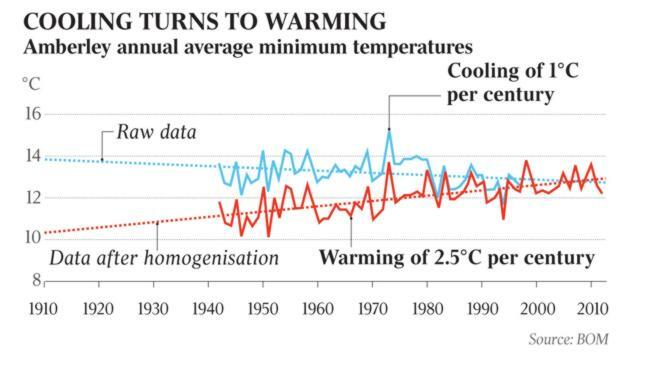 This ties in perfectly with my observations of how temperature is reported in Australia. I suggest you look up George Orwell’s letter to Noel Willmett, written in May 1944. It’s most prescient and very important for an understanding of this very fucked up world. Here’s a link to the letter. I feel the details, so eloquently stated by you (Raul), aren’t as important as understanding the very big picture. I do feel we are past changing the course of this very big vessel headed for the rocks. Understand the ramifications and prepare as best you can; relocation is probably the best route IME. relocation, depending where one is, of course. If one is in Europe, U.S.A., Canada, Britain? Then leave as soon as possible. It may give you choices not available in the west in the near future. Care to expand on this line of reasoning? My biggest concern with relocation is that it often seems poorly thought out (in my opinion). Predominantly Anglo-saxon / Caucasian westerners have been at the top of the hill for a good many years, and unfortunately we’ve made a pretty bad name for ourselves in most other places that are not predominantly populated Anglo-saxon / Caucasian westerners (e.g. South America, South-east Asia, India, Africa… basically everywhere, as our Empire exploits virtually everyone who is not us). While I’m sure people think places like Thailand, Peru, Brazil, Mexico, Morocco, Kenya, etc. are very lovely places to live/visit and the people treat you well there now, that might not always be the case. When the chips start to fall for the West, perhaps old grudges will be settled; years of exploitation will be paid back against any westerner that an upset local can get his/her hands on. If one heavily integrates themselves into the community through marriage and genuine philanthropy, one may find themselves not as susceptible to these risks… but even in those cases you’ll always be an outsider to that culture as it is not your own and they know that just as well as we do (even if we are blind to that fact at times). Another large concern is that the world is grossly overpopulated, and food production is constantly at risk of collapsing to levels that cannot sustain the world’s current population. I see far greater risk of food scarcity (and thus riots, violence, chaos) in some of the places I’ve mentioned above than in the near-dictatorial western nations. The view from the outside is almost never the fact/reality on the ground. I’m 11+ years out and doing fine. Yours is a long post, but significant of nothing outside of your familiarity. All I’m saying is this; we’re all faced with decisions, and the present situation, improperly understood, could mean your ability of movement is limited, if not forbidden. Look, this is complicated and if you haven’t been paying attention then you are pretty well fucked. Act now or you may not have the choice to act later. To be clear, it’s not that I’m suggesting I’m not fucked – I know at the very least I there’s change coming my way and I need to prepare for it, but I’m also suggesting that perhaps most of us (if not all of us?) are fucked regardless of what choices we make due to the magnitude of the predicament we’ve created. Those who stay will likely have to revolt, live a lie or die, and those who go are trusting in the goodness of the people in their newly chosen home not to treat them as outsiders when inevitable collapse finally arrives. As a young Canadian, I’m pretty big on multiculturalism. I could, like you, say things have been going swimmingly here in Toronto now for 100+ years, and thus they will continue to do so. But I know history suggests that isn’t true – not only is Toronto more of “balkanized” metropolis where minorities tend to gather with those who share their culture (sadly, in places where poverty is also more obvious), but when harsher times arrive old wounds will resurface and people’s distrust of other cultures/communities will return. That’s not me spreading fear, but the human condition demonstrated over thousands of years of history, and I see nothing that suggests it will be any different this time around (for all our knowledge, sometimes I lament that mankind is more ignorant, arrogant and unwise than they ever have been before). To my knowledge, there are no western Anglo-saxon / Caucasian countries that have already collapsed and have moved to a standard of living that is anywhere close to realistic – the only places I see this is in third-world countries that I identified above where I would be a visible minority/outsider. The only other place that it could be argued this might be happening would be in small transition/prepper communities that seem to be forming in small pockets throughout North America and other western countries; but whether they will grow into something more or be extinguished by an increasingly oppressive government is hard to say at this time. Bottom line – makes no sense to me to flee what small community and family resources I do have in Canada to go somewhere that I’m a complete outsider, particularly if it is a location that has endured several years of exploitation by North American / Western culture, or one with huge divides in wealth and risk to their food/water/resource supplies. That being said, if you have any insight/advice on how to go about building a strong community and sense of culture in non-Westernized, post-collapse (or “collapse-irrelevant”, if it was never overly developed and exploited in the first place) haven, please do share. Most of the people I’ve met who have “fled” the westernized world to live in better environs are those who are young, poor and living hand-to-mouth in backpacker dens (lots of ideas, yet no action / results) or those older, despicable human beings who relocate somewhere that their money can go further and live off their pension (that was made off the backs of others our Empire oppressed, or future generations, no less… and they have the gall to suggest they “earned” it) and think their newly adopted community actually has some sort of love/respect for them simply because they’ve got US dollars in their pockets and the indigenous people do not, further exploiting them through their ill-gotten wealth. Your closing paragraph is quite enough for me to end this back and forth. Debt Rattle Aug 22 2014: Janet Yellen is an Insult to Americans Debt Rattle Aug 25 2014: Is France About To Kill The Eurozone?